Image Source. Business Solutions. CD Duplication and DVD Replication Services for Businesses. When you are looking at a system to record and print on CDs, DVDs, or Blu-ray discs you can look at a simple robot with a recorder or two. That system will – most of the time – accept small duplication jobs and – most of the time - get them done. But haven’t we all moved way beyond that? Do you really want to go back to your first phone ?!? Fortunately, Rimage has systems with over a decade of software development in them. Today, you can submit record and print jobs to a Rimage system from anywhere in the world with internet access, from a Mac or PC or any workstation or homemade computer with a web browser, check to make sure the printer has enough ribbon for your job, span your content over multiple discs if you so choose, design your own disc artwork or choose artist-designed templates, choose to record your files or records on to CDs, DVDs, or BDs (or all three) from down the hall or miles away, and we really could go on and on – but you get the idea. And, if you want to connect your web shop or DAM or video editor to a disc making system, we can do that too. Want to know what never takes a vacation, never gets sick, never has a bad hair day, never has “issues” and can’t come to work? The Rimage Application Programming Interface. Do you have work that’s so important you can’t leave it to humans? We have the solution for you – integration – and we mean deep integration. Record and Print your CD/DVD/Blu-ray discTM using QuickDisc or DiscFlow or WebQD. Monitor the status of your jobs using Rimage System Manager or WebRSMTM. CD Designer is an application for Windows® based operating systems used to easily design custom professional looking artwork that is printed directly on the surface of your discs. 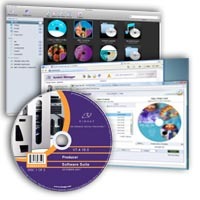 CD Designer lets you import graphics, merge data, photos, bar codes – and pretty much lets you put anything you can see on a screen on the top of a CD, DVD, or BD. WebRSM enables you to fully control and monitor your Rimage systems from anywhere on the network – or heck – even from home. Using WebRSM you can monitor status of your jobs, get accurate disc and media volume status, and control functionality. Rimage Video Protect is ideal for anyone creating video DVDs, to protect against unauthorized duplication. RVP's proprietary DVD copy control technology helps film studios and production companies protect their assets. Copy controlled discs have full DVD playability matching that of unprotected DVDs. Menus, special features and extras remain unaffected.